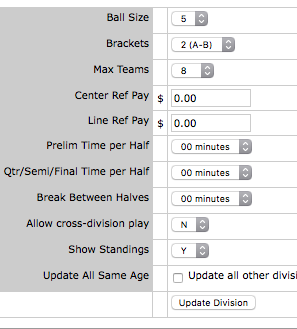 In the Scheduling Module, select Set up Tournament Divisions from the Action drop down menu. Enter the division name in the Division field. Select the sort order how you would like the divisions to appear on your website. -For example if you had Gold, Bronze, and Silver divisions; Gold would be 1, Bronze 2, and Silver 3. Select if there will be extra games or not. Select how many teams per bracket. To EDIT divisions already in place, make first delete any division you will not be using. Then add any new ones. Finally, make all the changes in place on the remaining divisions and click “Save Changes” at the bottom. The minimum settings for the divisions are at the top screen. However, you can set up more settings for each division by clicking on the “More” link. The graphic below illustrates the options available. 06: Update and/or review your tie-breaker rules.